onCourse cloud is a hosted version of onCourse which ish manage and maintain on your behalf. It is the same software and the same user interface as the locally installed application. Hosting of your onCourse server in a Tier 3 data centre located in Australia. ish directly manages the hardware and software, with the data centre providing redundant links to the internet. All networking equipment is full redundant and the database clustered across primary and slave machines. If your primary office loses power or internet, remote access to your onCourse server is still available from other sites. Management of your onCourse server. ish supply and manage the physical infrastructure that hosts your server, provide offsite backups and manage the upgrade process for you when new versions are released. You do not need to engage your IT support company for any onCourse related issues or assistance as you may with a locally managed version. Simplified user application access. No software to install or maintain - you launch onCourse by going to a URL created just for you. The software looks and behaves the same as the locally installed version; although you launch the application from inside a browser, you aren't restricted to the simplified user interface of a web application. The full onCourse user experience is available complete with multiple windows, printing and more. No need to update and install new client software when your server is upgraded. New versions of the onCourse client software are applied automatically when your staff log in. Staff access to onCourse from anywhere with internet access. Home, remote training venues, other offices - there is no need for you to set up and manage VPNs or software installation on multiple machines. Access is to onCourse is secure from any venue and encrypted with SSL at the same level of encryption as banking systems. A unique database instance for your training organisation. Every onCourse cloud customer has their own instance of the onCourse server application running. This means we can upgrade your software when you are ready, and your data is not locked into our solution - your database can be handed over to you for self management at any time should you choose to leave the ish Cloud for a locally managed onCourse option, or if you just want to get at your database. This demo is designed for people who wish to explore the onCourse user interface and features and give onCourse a test run to see if it is the right solution for use in their training organisation. Existing users who want to trial onCourse functions in a test database, provide training to new staff members provide or test the difference in performance between their locally hosted onCourse application and a cloud hosted onCourse are also welcome to access the demo. The demo contains sample data that is refreshed weekly, and which is shared between all current demo users. This demo database is not designed for users to enter real classes, students or enrolments. The onCourse Demo has a pre-filled user name and password. Just click 'login' to access it. If you are running the onCourse cloud demo, or trying to reach your training organisation's onCourse cloud instance, you will do this via your browser. Nothing will load in the browser window, but a pop up will appear asking you to Open with Java Web Start (default) or Save the file. 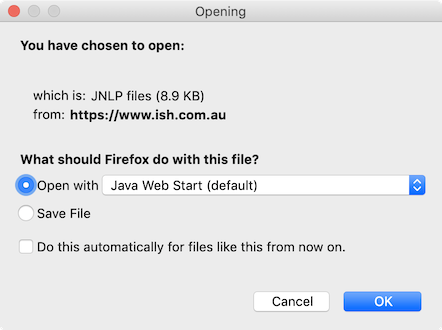 Select Open with Java Web Start. You may choose to tick the 'do this automatically' option to skip this step next time. The first time you run onCourse, or after an upgrade to the onCourse server has taken place, a new window may display notifying you that the application is being downloaded. This may take a few minutes. The onCourse application is downloading for the first time. Be patient! Once the download is complete, or if no download is required, onCourse will load to the login window. Enter your login name and password as supplied by your college administrator--or by ish if you are the first user of the software--and select login. In the onCourse demo, the login name and password is already filled in. For your own cloud hosted instance, use the login name and password provided to by your college administrator. You will also see a second splash page encouraging you to use Two-Factor Authentication (2FA), however it can also be skipped by clicking the 'Skip' button. 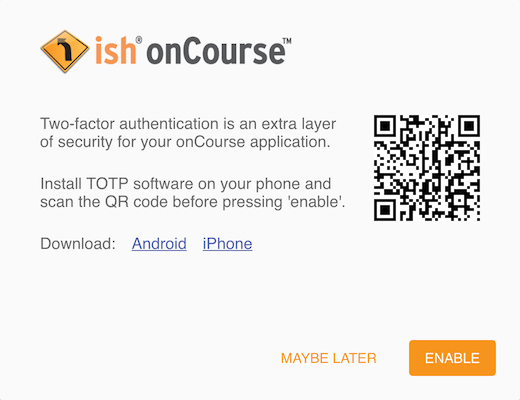 It will display each time you open onCourse until 2FA is enabled. 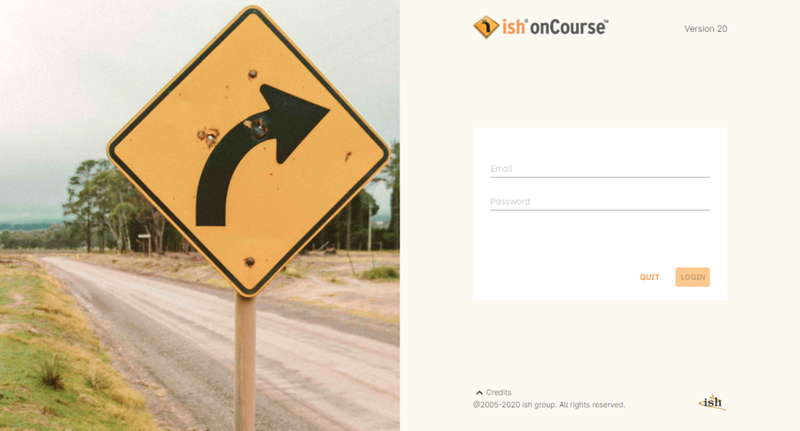 After you successfully login, onCourse will load to the normal splash screen. Proceed to use onCourse as normal, or if this is your first time in the software, explore the user and interface and press all the buttons to see what they do! On many screens you will see a help icon in the bottom left hand corner - this will take you directly to the part of the user documentation that relates to that part of the software. If you make it to this screen you have logged in successfully. Well done! The first time each user logs in after an onCourse upgrade has been deployed, you will see the release notes in a separate window. It is important to read these release notes as there may have been significant changes made to the software that impact on some of your business processes. 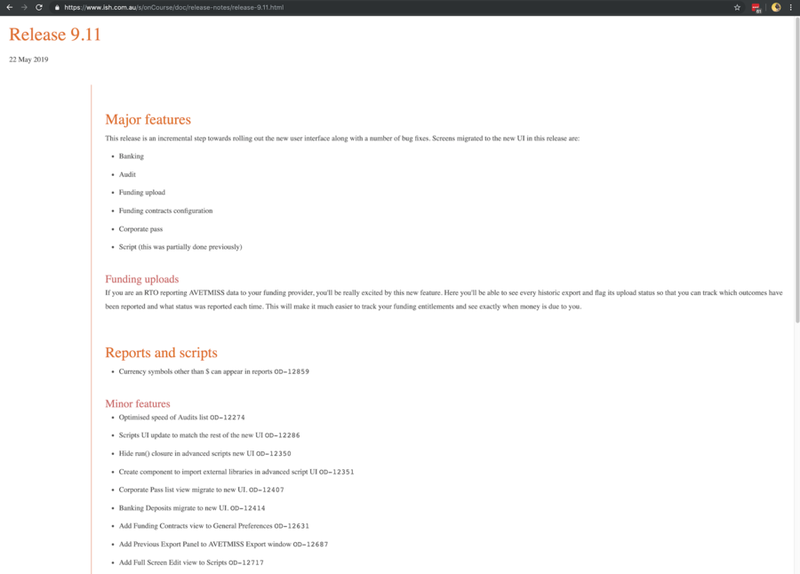 Some times, the release notes will include hyperlinks to updated user documentation, which you may also want to review. If you have any question about the release notes, don't hesitate to get in contact with us. onCourse is also available as an installed, standalone application, rather than the JNLP version that you download via a web browser URL. Start the download, then run the installer.exe that downloads. When installation is complete, the icon should appear in your Start Menu. However, if you're having trouble finding it, you can also search for it in the search bar by searching the term 'onCourse'. Start the download, you can set it to save the file or open it from the location, it doesn't matter. When the download finishes, drag-and-drop the application file from the folder that opens on to the desktop. When the application opens, you'll notice the log in screen looks very similar to the browser URL version, with a couple of extra fields--Host and Port. If you have logged in to onCourse before using the browser URL version, these two fields should automatically populate themselves, so you shouldn't need to change anything within them. If you notice a 'Server not available' error when you attempt login, it's likely there is something incorrect in one of these fields. Get in touch with us via our support channel, Squish, and we can check this for you. Q: After going to the URL, my browser has given me a security warning. What do I do? A: Seeing this window (or not) depends on the security settings of your browser. If you choose to 'trust' the certificate, you shouldn't see this warning again. If you don't 'trust' the certificate, you won't be able to proceed with accessing the onCourse application. Q: Isn't Java a security risk? A: No. Java has been around a very long time and is used at large and small companies by billions of people every day. It powers more websites than just about any other technology. However it has been used in the past for things called applets in your browser and this technology has had flaws which allowed malicious websites to do nasty things. onCourse is different: running the webstart version is exactly the same as running an application on your desktop directly and opens no new security holes. When you see advice about turning off Java in your browser that is related to these applets and not to the way onCourse runs or any other Java applications run. Q: When I try to log in, the window shakes and gives me an Authentication Error. A: This means your login name or password is wrong. Try typing it in again and login again. If the problem persists, contact ish. For users who have logged in successfully before, but are now seeing this error, this may mean the hosted cloud server is down for maintenance (you will have received notification) or that your local internet is down. Please contact ish.